Not far outside Bangkok is the world's largest crocodile farm, Samutprakarn Crocodile Farm and Zoo, with over 100,000 different crocodiles. Here you can walk around and see these special animals, and you can also see various shows and performances. Among other things, you can watch stuntmen who stick their heads, arms and legs between the crocodiles' teeth. Wrestling with crocodiles and other stunt tricks are also showcased. There are also other exotic animals such as tigers, snakes and chimpanzees on the farm. Most people who have ever visited a city are accustomed to transportation being underground by subway, or by tram at street level. 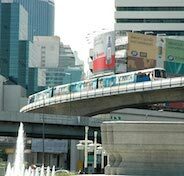 Bangkok is one of the few cities in the world that offers its visitors the ability to use the Sky Train. The Sky Train whizzes along through the air and has heavy city traffic just like the subway does, but with the major difference that you're not just looking at the dark underground. Instead you’ll be able to see areas of the city from on high. Just riding the Sky Train is an experience in itself and is something not to be missed when visiting Bangkok. It’s a great feeling to travel using this mode of transport and to get to see Bangkok's bustling streets from the air. A bit of an extra special experience is visiting the flower market Pak Khlong Talat in Bangkok. Here you can buy or just look at flowers in every colour and smell the hundreds of different floral scents. The Flower Market is Bangkok's largest and it is not difficult to be fascinated by what you see. The flowers can be very different from those we are accustomed to seeing here in Europe and therefore it seems exotic to look at the various flower species. If you want to see something especially awesome, you should arrive early in the morning when all the flowers from all over Thailand are loaded into the market. Trying out Street Food on the streets of Bangkok is something that may sound a little scary, and it's easy to think about food poisoning and gastric flu. However, the fact is that the Thais are very hygienic themselves and the chance of getting food poisoning is very small when eating any kind of cooked food in Thailand. Somewhere in Bangkok where you can sample a huge variety of food is the Wanglang Food Market. Here there are several different dishes from the Asian cuisine, and much of them taste very exotic, and far from what we are accustomed to eating otherwise. It is not just the dining experience at Wanglang Food Market that is fascinating—even the people who come here should be observed. 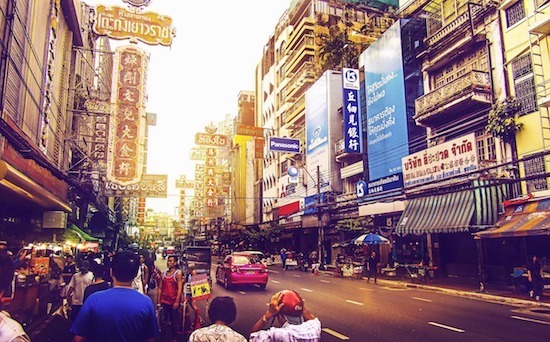 All of Bangkok's various societal groups come here to eat, so you shouldn’t be surprised if you find yourself standing in the queue with a student or a doctor from a nearby hospital. One of the attractions in Bangkok that is ranked highly by previous visitors and tourists is the Royal Palace. The Royal Palace is located in the central part of the city and it's easy to get here. The palace is a large complex consisting of several temples, beautiful houses and gardens. The whole area was from the 1700s until 1925 the home of the king and the country's governing body. Visitors can walk around and be fascinated by the magnificent architecture of the beautiful surroundings while being fed with interesting information about Thailand's culture and royal history. The palace is open to the public seven days a week between the hours of 9:30 and 15:30. It’s important to know that you have to cover your legs and shoulders to be allowed inside. No formal wear is needed—a t-shirt and a pair of trousers is just fine. Thailand is one of the few places in the world where it is possible to go shopping and spend your travel funds sitting in the hull of a boat on the water. This “boat shopping” can be a lot of fun when you visit a floating market. 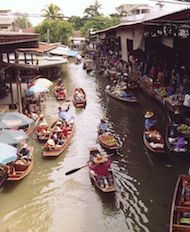 One of the main areas of the floating markets is Damnoen Saduak, located in the rural areas (about six kilometres from Bangkok). You can take various day trips by boat to try this very special shopping experience. In addition, you get to see what a Thai family looks like with locals negotiating the price on everything from fruit and vegetables to spices and other things. Day tours depart from downtown Bangkok and it’s usually the fast longtail boats that take you out to the countryside. With its black bears, tigers, leopards, open paddy fields, exotic fruits and preserved natural environment, Khao Yai National Park is an excellent place to visit to get some relaxation from the stress of Bangkok's streets. This National Park is 17.5 miles northeast of Bangkok, and here you can take arranged day trips that depart from the capital. Usually you’ll ride on an elephant through the park and enjoy a little light swaying to view the amazing Thai nature. A ride on the elephant in Khao Yai National Park is an amazingly exotic experience that will not soon be forgotten.